This “Pay what you want”-module is 16 pages long, 1 page front cover, 1/2 a page advertisement, 1 page editorial/SRD, leaving us with 13 1/2 pages of content, so let’s take a look, shall we? All right, still here? It is the summer of 92 AU in the Caneus Empire when two shepherds named Adler (German for eagle, btw.!) and Karl finds a weird silver skull and a ring in an old laboratory. Gifting the ring to his beloved and showing off the skull’s weird glow, the shepherd inadvertently has found remnants of the Cavian Empire. Cavians, in case you didn’t know, are the mouse-like hive-mind possessing humanoids with innate psionic powers of the NeoExodus-setting. And yes, this is a full-blown psionics-module, compatible with Dreamscarred Press’ Psionics Unleashed. But back to the topic at hand – strange things started happening: The town’s women started acting strangely, some of them even falling into a kind of coma. The town’s priest committed suicide and poor Adler and his skull have been quarantined. Enter the PCs, in the employ of Sir Otto von Korrien. On the road to Oldenhaffen from Macawi the PCs have to defeat 2 ogres. There, the local remaining priestess Sister Fritzi has already identified the skull as not the origin of the curse – essentially, it converts spells, but not psionic powers, cast on it into light-spell like effects and is completely harmless. After a short, very rudimentary investigation, the players are led to and the proceed to explore the cavern containing the Cavian complex. Alas, the place is now home to a selection of deadly threats – from the quill-furred, dog-like razorfiends, faulty deranged trepanners to finally finding aforementioned beloved woman – with the ring that actually is the source of the problems, for its is an intelligent weapon created to destroy the Sorceror-Kings of Abaddon in ages gone by. Either by combat (with summoned thought-eaters) or by diplomacy, the PCs can get the ring and lift the mental static “curse” on the town. This is not where the module ends, though – whether the PCs hand over the ring to Cavians or keep/destroy it – the choice is up to them and may very well have unforeseen consequences in the future. We get passable maps for the complex as well as the overall place on the continent where the adventure is set. Editing and formatting are top-notch, I didn’t notice any significant glitches. Layout adheres to NeoExodus 2-column full-color standard and the full-color artworks are neat. the pdf comes in a second more printer-friendly version. Cartography is nice and actually better than in older NeoExodus-adventures and the pdf has no bookmarks, but at this length, they are not strictly required. J. P. Chapleau has created a nice module steeped in NeoExodus-lore here – while at this length, we of course get no epic narrative, but what we do get is a nice little crawl that has some social interaction, interesting terrain features and a climax that does not necessarily boil down to “kill em all” – what more can you ask for in a short “Pay what you want”-module? The answer is: Nothing. An enjoyable read for an unbeatable price, my final verdict for this module will clock in at 5 stars +seal of approval. You can get this module for any price you want here on OBS! This installment of the “More Feats”-series is 3 pages long, 1 page front cover, 1 page SRD, 1 page content, this time with 9-conjuration-themed feats! -Arcane Armorer: Increase armor bonus granted by conjuration (creation) by +1. -Barrier Spell (Metamagic): When casting spells with a casting duration of 1 round or longer, get 3x spell level SR and the same bonus to AC. +1 spell level. -Bolstered Health: gain hit points equal to 3x the highest level conjuration (healing) spell you can cast. -Channel Health: When casting conjuration (healing), roll one die twice and take the higher result. In exchange, become fatigued for 2x spell level rounds. When already fatigued, become exhausted and take non-lethal damage. -Dimensional Striker: When using dimensional savant to flank yourself, deal +1d6 damage to each flanked opponent. Nice one! -Dramatic Teleportation: Impose a -4 penalty on foes witnessing you teleport for 1 minute. That one’s nasty when combined with teleporting items due to the lack of saves…not too keen on it, but still ok.
-Persistent Summons: Your summoned creatures can’t be dispelled by caster levels lower than yours. Cool feat…but take into account the repercussions for your campaign world’s logic. Can become problematic. -Seething Summons: When conjuring creatures while under the effects of a rage, your summons enter the fray as affected by a rage spell. Obviously requires moment of clarity. An ok, if a bit weak feat. -Wonderworker: When casting divine spells of 6th level or higher, you create a vast display tha can be perceived up to a MILE away and fills an area of 50 ft. times spell level centered on the target of the spell. Allies are inspired, foes demoralized for 1 round and adversaries of HD less than the spell level diametrically opposed to your deity’s alignment instead become shaken for 1 round – all sans saves. Per se, a cool idea – but the wonder will turn old fast. the vast visibility range is problematic in my book and the lack of saves is not something I’d enjoy – a longer duration and instead a more limited application could have made this work better. Editing and formatting are top-notch, I didn’t notice any significant glitches. Layout adheres to Abandoned Art’s 2-column no-frills standard and the pdf has no bookmarks, but needs none at this length. Daron Woodson has created some unconventional feats herein and the approach to how the respective feats utilize spell-levels should be considered rather interesting. That being said, I also have the notion that the feats tend to be a tad bit off on the balance scale -not by much, mind you, but still – some feel a bit weak, whereas others (especially Persistent Summons) can alter the internal logic of your whole campaign. While not broken per se, I hence can’t rate this the full 5 stars and instead will settle on a final verdict of 4 stars – a solid pdf, though one that should see close scrutiny by the prospective DM. I’m changing my format here for a second to tell you ladies and gentlemen about a worthy little project I’m proud to be a part of. Chances are that you have, some time, read a supplement by the extremely talented Christina Stiles – she’s done A LOT of work for A LOT of companies including R/SGG’s “Christina Stiles Presents“-series, KP’s “Journeys to the West” or her work for Misfit Studios, which includes the Spiros Blaak setting (which is scheduled for an update to PFRPG) as well as her own imprint. What you may not know is that she is the only bread-winner of her household and that her family, beyond expensive meds, has suffered some unfortunate catastrophes. Now, she is doing a charity IndieGoGo-campaign to get out of that rough patch and deliver some quality material in your hands at the same time. Owen K.C. Stephens; RPG Superstars Mike Welham and Steven Helt; Rick Hershey of Fat Goblin Games; Mark Gedak of Purple Duck Games; artist and author Jacob Blackmon; Robert Hudson, Jr.; Andrew and Heleen Durston; Matt Stinson, Amanda Hamon, Carlos Ovalle, Tracy Hurley, Christina herself and of course, yours truly, will work on this product!! So, if you’re interested in the idea of a NPC-collection using the talented-rules, here is the link to the IndieGoGo-campaign. Thank you for reading, and no fear – I won’t be pimping KS/IGG’s all the time and more reviews will hit the site soon. P.S. : If you’re not familiar with IndieGoGo – they’re essentially like Kickstarter, but they immediately charge your card, not upon the project’s completion like KS, so fi you want to pledge, make sure you have the funds ready. This massive pdf is 100 pages long, 1 page front cover, 1 page inside of front cover, 1 page editorial, 1 page ToC, 1 page SRD, 2 pages of introduction to the matter at hand, 3 pages of advertisement, 1 page inside of back cover, 1 page back cover, leaving us with 88 pages of content, so let’s take a look! Now I’ll come clear from the beginning – while I love cinematic scenes, to me it is REGULAR guys accomplishing these feats of derring-do what makes them epic in the first place. I’m a bit of a mythic skeptic and while I have run my fair share of mythic scenes (crashlanding a flying fortress through the defense-fortresses and armies as a culmination of a holy war in my last campaign, to name one), they have to be earned – becoming mythic is something only a scarce few should accomplish and honestly, I was rather afraid that Mythic Adventures would up the ante too much. Thankfully, the rules allow for a relatively tight control on how much mythic powers become available and hence, I can get behind the system…only problem being that one hardcover was simply not enough by any stretch of the definition: Whether its monsters, paths or spells – there simply wasn’t enough space to cover mythic rules in the level of detail I’m comfortable with. Enter this book, among others. With lightning-quick speed, Legendary Games have delivered ALL the missing core-spells, upgraded to their respective mythic variants, but before we take a look at them, we are introduced to two feats, one of which unlocks mythic cantrips (what may seem as a contradictio in adjecto, but more on that later) and a feat that allows you to apply mythic power to scaled spells – which is brilliant: Communal, mass, improved etc. – twice your mythic tier of such variant spells are learned, adding more fuel to burn for casters. We also get a new 1st tier-ability with Mythic Minor Magic as a bonus mythic feat or Mythic Spell Scaling – i.e. a way to get easy access to both new feats. Next up are spell-lists by class – Bard, Cleric, Druid, Wizard etc. – including domain-lists, bloodline-lists etc. – as a cool benefit, each of the spell-lists mentions the respective page upon which the mythic spell can be found and is additionally linked to the page – one click and the pdf puts you on the page: Kudos for making this so easy to navigate. 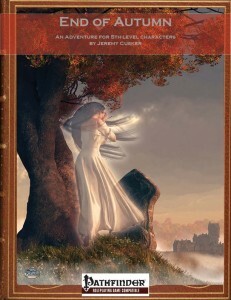 Now, of course the Mythic Adventures-spells from the hardcover are not in here, but after using this pdf for a prolonged time, I honestly wished my hardcover of Mythic Adventures would be that easy to navigate. But that’s not what interests you now, is it? What about the spells? 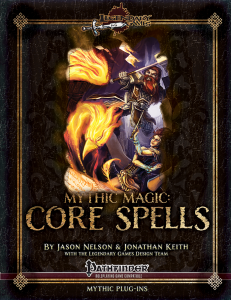 Well…each and every spell from the CORE-book that’s not covered by Paizo’s Mythic hardcover has been tackled – several of which with options to augment them with or without mythic tiers required – usually 3rd, 4th or 6th level, with some examples like Dominate Animal providing an upgraded augment unlocked on 6th mythic tier, allowing you to highjack the long-time (1 day per level rather than an hour)-dominated animal’s senses as a swift action sans ill-effects of disorientation. Now I have an issue as a reviewer here – as much as I’d like to, I cannot cover each and every spell herein without blowing this review up to unprecedented length, so let me instead provide some samples to give you a good idea of what to expect from these pages, all right? Let’s take Deathwatch as an example – this spell allows you to roughly determine the percentile hp of the creatures still remaining: above 90%, 90 – 30% and below 30% and also shows negative levels and con drain/damage. Delay Poison adds half mythic tier as a bonus to saves versus the poison once the spell has run its course, whereas Delayed Blast Fireballs, much like many damage-dealing spells, have their damage-dice expanded and may also be augmented at 3rd mythic tier to instead detonate multiple times for less damage or at 6th tier, further expand the damage-dice when powered by mythic power and even ignore resistance and immunity to fire. Now I mentioned cantrips – so what about light? Apart from light, mythic power equal to an incoming darkness-descriptor spell may be used to counter darkness-effects as an immediate action via this spell. Prismatic Walls in mythic versions afflict foes close with prismatic spray and later extend the range of said zone of death further. Harder to destroy Prying Eyes with darkvision and resurrecting allies can now be done with less costly materials by using mythic power. One central rules-theme would be the dissolution of HD-limits, increased damage-dice, ignoring immunities, adding mythic tier-score to effects, extending AoEs and generally more flexibility though that does not apply to all of the spells, with variety comes a necessity to reflect this variety in the respective mythic spell designs. Of course, interaction between mythic invisibility and mythic see invisibility as well as how they interact with non-mythic versions are covered, even beyond the latter’s ability to reduce concealment miss-chances. These showcase well the level of detail required for a this broad coverage of spells. In fact, while there are unifying themes among the spells, the augments and mythic versions are surprisingly varied while still maintaining a distinct voice of rules that lends a sense of wholeness to the pdf’s mythic spells. Editing and formatting are very good, I didn’t notice any significant glitches apart from minor issues like a letter that was supposed to be bold not being bold – nitpicky gripes at best. Layout adheres to an easy-to-read full-color 2-column standard, with neat full-color artworks mixed with pencil-drawings in b/w. The artworks are awesome, but some you may have seen in other Legendary Games offerings and the mixing of both styles detracts slightly from the otherwise perfectly unified look of the pdf. As a layout-peculiarity, page 64 is only half covered – there seems to be an illustration missing. We get this offering in an additional, more printer-friendly version and both come bookmarked excessively, which, alongside the immensely useful linked spell-list result in this pdf being superbly useful and easy to navigate. This is beyond ambitious. Within record time of the release of Mythic Adventures, Legendary Games has released this massive book of CRUNCH. Of in your face, no-frills, full-blown crunch. As a reviewer, books like this are WORK – crunching numbers, looking for discrepancies. With that and my designing-experience, I can attest that this book must have been a chore at times to create and it speaks of the diligence of designers Jason Nelson and Jonathan Keith that they managed to get this out as fast as they did and in the quality. Now let’s get one thing out of the way: Yes, this is not a particularly cheap pdf – in fact, it is rather expensive. But what it covers also makes this not just AN expansion for mythic spellcasting, but rather THE expansion: With diversified augments, the mythic spells herein are actually much more eclectic in the options they allow than basic, non-mythic spells, hence making casting these spells much more enjoyable. Beyond that, this pdf covers so many spells and does this in a way that makes this supplement look like a chapter that has been cut from Mythic Adventures – the massive array of mythic spells herein should not be considered optional for a mythic campaign, but rather as a required collection. Is it perfect? No, but it succeeds with bravura at its given task and while it may not be a cheap offering, if you’re playing a campaign using mythic rules…then your group needs this pdf. And yes, the price-point hurts, as do the scarce few gripes I could muster – but still: My final verdict will clock in at 5 stars – How else rate a supplement for a mythic campaign that is NOT optional and may be considered a required expansion-chapter of Paizo’s hardcover? If you run a mythic campaign, then this should be considered a required purchase. You can get this REQUIRED supplement for Mythic Adventures here on OBS and here on d20pfsrd.com’s shop! All right, you know the drill – 3 pages, 1 page front cover, 1 page SRD, 1 page content, so let’s take a look at these weapon qualities! 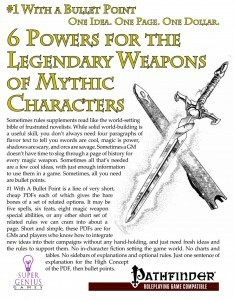 First of all, let me say that I’m not happy with Paizo’s nomenclature for Mythic magic weapons – Purple Duck Games had been using the term “Legendary” for years to denote their awesome items that improve with your character’s levels. That out of the way, these qualities here refer to the Mythic Weapons, so what do they do? -Shining: Weapon glows in intensity ranging from daylight to a candle’s flicker. Effect counts as light equal to your mythic tier. So…does the brightness of daylight intensity counts as daylight regarding light-sensitive adversaries or creatures susceptible to exposure from daylight? I assume no, since it is treated like light, but I’m not sure. Overall, not particularly impressive. -Enormous: Oversized items of 1 size category larger than the wielder, but sans the penalty. Different effects based on the slot they occupy; Eyes halves penalties to “site-based” [sic!] perception-checks and may add their surge to knowledge-checks. Shields can increase their AC-bonus by the “Item’s surge die” – does that mean the maximized die? or simply rolling the surge die and adding the result? I’m honestly not sure. -Forceful: The item counts as force effects – armors working analogue to mage armor or shield, whereas weapons e.g. count as force effects, spells-in-a-can effects get the [force]-descriptor. -Orichalcum: Weapon attunes to DRs of foes – adamantine and similar DRs help but for one hit, after that, the weapon temporarily attunes to the DR and ignores it. -Signature: Item only works for one individual. Okay, but a bit lame. -Warning: Spend a point of legendary power to get a move or swift action in a surprise round where you can’t act or a partial action in a round where you can act. Editing and formatting are good, though not perfect. Layout adheres to a potrait-3-column standard -not a big fan here – in my not so humble opinion, 3-column layouts work in landscape, but in portrait always seem cluttered. The pdf has no bookmarks, but needs none. I’m honestly a bit underwhelmed by this pdf – while there is nothing excessively wrong with these qualities, they also didn’t blow me away. Add to that minor ambiguities and we arrive at a final verdict of 3 stars – an okay array of weapon qualities, but by far not the best work Owen K.C. Stephens has done. You can get this neat pdf here on OBS and here on d20pfsrd.com’s shop! The first book of TPK Games‘ ” Feats Reforged”-series is 40 pages long, 1 page front cover, 1 page editorial, 1 page SRD, leaving us with 37 pages of content, so let’s take a look, shall we? We all have encountered the issue – there just are some throw-away feats that simply become useless over the levels (or are useless in the first place and are only taken as a prerequisite for another feat or a PrC) – this is what this pdf seeks to change: Herein, we get the feats from the core-rules, reforged towards providing scaling benefits throughout the levels. Let’s for example take the utterly bland +2/+2 to skill-checks group of feats. You know the feats I refer to. In TPK Games’ version, these feats get a new benefit at 7th level, allowing the character to 1/day reroll one of the skill-checks of the applicable skills and at 14th level, reroll both of them twice for a total of 4 rerolls – a more than solid benefit that makes these feats at high levels actually more useful than at lower levels. The crafting feats have the required time at higher levels cut down to by up to 20% depending on the feat in question. Cleave, for example, has its AC-penalty diminished over the levels and blind-fighting allows you to move blindly at more than half your speed without falling prone at only a DC 5 acrobatics-check and later completely omits said skill-check, though the benefit for the former fails to mention that it refers to moving blindly – but that’s admittedly a nitpick. Conversely, another candidate among the throwaway-feats, endurance, gets a 1/day reroll and an increase to +5 – here, a more pronounced bonus would have been justified, but that may only be me. Empowered Spells let you reroll one (or later two) of their damage dice, whereas extend spell allows for later extension of up to triple spell duration instead of double the amount – since metamagic feats per se count among the weaker options, these improvements imho add quite a bit to their value and make them work better – so kudos for that! Extra channels, ki etc. nets you later a third channel/ki-point and then a fourth and extra mercy delivers one bonus mercy at 14th level. Long-range snipers using far shot learn to ignore the penalties of the first and later the second range increment and the fleet-feat adds another 5 foot and lets you keep your movement in medium armor at 14th level. Improved counterspell may have ended up a bit on the strong side of things – allowing first a spell of the same school and level and later a number of spell-levels of the same school equal to the target spell to counterspell may be a bit much, but only a bit. A tad bit weird – Improved Two-Weapon Fighting’s iterative attack has its penalty reduced first to -3 and then 0, thus making the off-hand attack actually more effective than the attack with the primary hand as well as the iterative attack with the primary hand, breaking the rules for iterative attacks – not a fan of this design. Now non-monk users should rejoice at the reimagination of Improved unarmed Strike – at 7th level and later at 14th, the users of this feat now calculate their base-damage as if one size category larger, further increasing the damage output – though thankfully the feat can’t be abused – only the greatest of the possible damage die-increases is applied – no stacking for monks. Point Blank Shot also gets a slightly increasing bonus and more importantly, increasing range (first 40 ft, then at 20th level even 50 ft) – very good! The redesign of Weapon Finesse should go conform with many a playstyle/house-rule out there: At 7th level, the feat as reforged herein allows you to substitute ½ dex-mod instead of str to damage with finesse weapons, whereas at 14th level, the full dex-mod can be used. Two thumbs up – dex vs. str balance is maintained and agile combatants still can deal a bit of additional damage. Vital Strike on the other hand still has an issue – the feat’s text is a bit ambiguous, stating “When you use the attack action, you can make one attack at your highest base attack bonus that deals additional damage. Roll the damage dice for the attack twice and add the results together, but do not multiply damage bonuses from Strength, weapon abilities…” It is clear that RAI the Str-mod is supposed to be added only once, but the text could be misinterpreted here to mean a double Str-mod to be added to the attack. A nitpick, yes, but a glitch nonetheless. Editing and formatting are very good at this point – the first incarnation of the pdf had a couple of glitches, almost all of which have been purged.. Layout adheres to a crisp 2-column b/w-standard with ok b/w stock art. The bookmarks provided are only alphabetical, not per feat, which is a bit of a pity since the latter would have made navigation probably slightly more comfortable – perhaps nested in the alphabetical bookmarks? 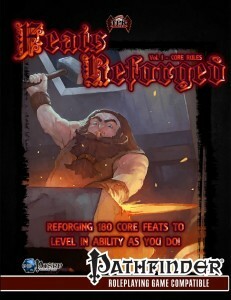 TPK Games’ mastermind Brian Berg delivers us a pdf of reforged feats that succeeds at its given task of making feat-choices relevant over the course of multiple levels and even add sensible bonuses over the course of the respective levels. That being said, apart from the scarce few hick-ups here and there, this pdf does have one particular flaw in its basic logic: The introduction states that using these feats will not result in a balance-change if the adversaries also get access to them. At least in my opinion, that’s a fallacy – some classes simply get a lot more feats than others and these classes are the true winners from implementing this system – feat-heavy classes benefit the most from this pdf. Taking a look at these classes, though, you’ll quickly realize why I’m not screaming brimstone and death right now – feat-intensive classes (*cough* fighter */cough*) are not necessarily the strongest of the bunch and a power-increase for them will probably not break a gaming-table, nor will the upgrade for the woefully weak metamagic feats hurt balance. Quite the contrary, they may actually become viable options. So yes, generally, I consider this a well-crafted supplement that delivers a good start of a massive relaunch of feats in general, one that makes me curious on how TPK Games will handle some of the utterly broken feats to come from books like Ultimate Magic and Combat. Generally, this pdf can be considered a successful experiment, though one that has rough edges here and there – breaking iterative attacks with off-hand weapons, some minor missed chances to upgrade throw-away-feats…it’s scant glitches like these that keep this supplement from reaching the highest echelons of the rating-scale. Still, this pdf can be considered an interesting, promising start for the series, well worth 4.5 stars, rounded down to 4 for the purpose of this platform. 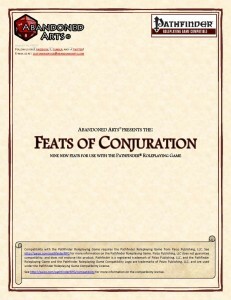 You can get this new take on feats here on OBS and here on d20pfsrd.com’s shop! This module is 60 pages long, 1 page front cover, 3 pages advertisement, 1 page editorial/ToC, 1 page back cover, leaving us with a total of 54 pages of adventure, so let’s take a look, shall we? The city of Fenleist is lavishly mapped, but the pdf makes a weird turn on the page of the map – it is depicted much like a landscape-style 2-pahe spread, which yields slightly unpleasant results when printing this particular page out. 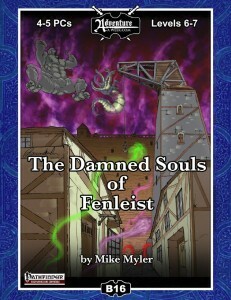 The PCs arrive in the glorious town of Fenleist, known for its huge landmark crane, on noon – and action: Immediately, the pastoral idyll is shattered by an eclectic array of deadly creatures from all across the planes (which is not made easier by the strange impediment of souls not being able to pass on to the afterlife!)! Here, a particularly interesting feature should show up – the pdf actually not only offers variants of the creatures in 3.5 and PFRPG, the encounters actually differ: First of all, the creatures and NPCs are more complex than you’d expect. Secondly, even the read-aloud texts reflect these variations -kudos for stepping up the dual-rules format in here! Upon dealing with at least the immediate threats, the PCs are briefed by Constable Vandersmythe. The detail here is really neat – e.g. the swarms among the foes can be optionally handled by AoE-challenged via helpful NPCs and even via utilizing the crane to squash the swarm via the especially valuable and hard timber here in Fenleist. The following investigation is rather complex – and sooner or later Tarryndorn’s agent tries to sell cursed items to them that allow the wizard to spy on them and squeeze them for what they have unearthed so far while feeding them half-truths and banal pieces of information. Worse, the rather uncooperative inquisitor is fed suggestions by Tarryndorn – if the PCs try to follow the suspicious hunter, they’ll run right into a vast squad of undead and will have to contend with the inquisitor to boot – hopefully without killing him. Should he survive, alas, he’ll not be more of a help – he has just lost a decade worth of memories…. Upon the return to the town from the cemetery, the PCs may be hailed as heroes… but they’ll also witness a magical wave that they can triangulate towards its origin, an old oak (which is actually a stone-replica of a tree!) that hides the entry to aforementioned ancient ruins. Now old-school legwork searching may also yield the entry to the place, as does entering the rather lethal magical subterranean machinery of Fenleist’s landmark crane (though the latter is situated in the beginning of the module and would have been imho better placed here, but that’s a personal preference and hence nothing that will influence my verdict) – both come with their very own challenges. In order to gain entry, though, the PCs will have to brave Rassdradden Reach, a vast chasm 500 ft. over an underground lake – and while balancing across the narrow pathway spanning it, of course a deadly adversary attacks – a sorceror in 3.5, a neat summoner-build in PFRPG: The second creature, by the way, that comes with a mini racial variant in 3.5! Rassdradden Ruins is a terrifying complex – patrolled by mhorgs and crysmals, though beyond the grisly remains, that is not all – take an ifrit monk with exponential shurikens that double after travelling for ten feet, for example – or what about former adventurers turned into undead guardians of the wizard (and we all know how dastardly well adventuring groups can screw you over!) and finally defeat the crazed elven wizard…that’s not where the module ends, though – in order to find the missing “Wayward Swords” and end the threat of the conjunction, the PCs have to deal with one of the coolest puzzles I’ve seen in this generation of adventure modules – an origami-glyph-puzzle supplemented by 3 puzzle-sheets! And yes, you may just skip this part with a roll if that’s your preference, but oh boy would you miss out! Two thumbs up for this cool, creative puzzle! Opening a planar rift, the players can jump into the rift to come out on a miniature planet, where the missing adventurers…as well as Fizzlewick, the legendary creator of the crane and founder of the town are imprisoned! Saving these guys should add even further adventure hooks and indeed, mark the beginning of a new era for the town! Editing and formatting are very good – apart from the double-page spread and some very minor glitches, I did not encounter any that impeded my understanding of the module. Layout is beautiful indeed – taking a cue from the vastly improved layout in the Pathmaster-modules, this book’s parchment backgrounds and full color artworks are joys to behold indeed. The pdf comes fully bookmarked for your convenience and with 2 player-friendly versions of the maps (the town here is in portrait format, so in doubt, just print that one) and the puzzle-sheets are also rather cool to see in such a supplement. Author Mike Myler has created something ambitious – a free-form, complex investigation with an intelligent antagonist and intriguing builds as well as iconic places and challenges await. Now mind you, this is no module for inexperienced DMs – why? Because the act of investigating the respective happenings and the transitions from scene to scene need some fleshing out by DMs to make the adventure properly work – that does not mean that it is too sparse in its information, just that…well – let’s not mince words here: This is hard to run. Primarily not because it is confusing, but rather because it feels unorganized. DMs are expected to carefully sift through the text and deduce what the PCs are supposed to uncover – essentially, this module gets a bit lost in its own sandboxyness. Partially that’s due to e.g. the crane’s exploration being introduced at the beginning (when it’s essentially a potential penultimate locale), partially it’s due to a relative lack of straightforward clues – e.g. the magical wave, while a great idea, feels a bit clunky here. Making that one a near-constant phenomenon and then offering more complex means of triangulating its origin (ones that the PCs can slowly unearth) would have probably made the module feel a bit less disjointed. The locales and story-threads and even how they’re interwoven – all that is rather intriguing and indeed worthy of 5 stars +seal of approval, but their connections to one another feels overall rather flimsy. A tighter synopsis and a more structured event-flow would have catapulted this module up to the highest honors. As provided, it offers awesome locations, cool adversaries and a complex mystery, but also requires significant work from DMs to make the events flow naturally. Hence, my final verdict will clock in at 4.5 stars, rounded down to 4 with an express recommendation for experienced DMs to try their hand at this one – I know my players will be all over this module! Author Mike Myler has improved at a rapid rate and if this module is any indicator, one should definitely look forward to his future offerings and keep an eye on his rising star! You can get this challenging, nice module here on OBS (also in print, btw.!)! The second in Kobold Press’ series of racial pdfs is 19 pages long, 1 page front cover, 1 page editorial/ToC, 1 page advertisement, 1 page SRD, leaving us with 15 pages of content, so let’s take a look, shall we? So what are Darakhul? 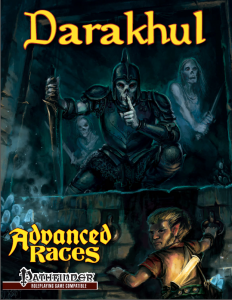 well, they are a race that has haunted my twisted imagination ever since I had the good fortune of being able to read the closed Open Design “Empire of Ghouls” – essentially, Darakhul are intelligent ghouls that inhabit a subterranean, militaristic empire that constantly requires fuel in the form of flesh. Taking the idea of social predators up to 11, their empire can essentially be envisioned as a kind of blend of twisted theology, Roman discipline and undying hunger. Add a well-greased war machinery, complex social structures and we have an empire of foes that is frightening on more than one level. And now, you can play these nasties. Darakhul get +2 Cha, no con-score (using like undead instead cha) are either medium or small (with small benefits balanced out by a reduced movement rate of 20 ft. versus the 30 ft. of medium Darakhul), darkvision 60 ft., burrow speed 10 ft., a bite attack 8which unfortunately does not specify whether it acts as a secondary natural attack or a primary one), darkvision 60 ft. and count as undead. Undead PCs are a nightmare to balance and usually, my knee-jerk reflex would be to start complaining right now…but being permanently annihilated at 0 HP, -4 to ability and skill-checks in day light (-2 in the spell’s area) sans save and lethal starvation when not consuming sufficient amounts of meat actually do a good job of making the race more fragile and balanced…so yeah, no gripes. After this basic crunch, we are introduced to the Darakhul and how they interact with the world, advice on how to avoid the Drizz’t-syndrome (or at least make it cool) and cover the problem of proper disguises – for Darakhul on the surface (or anywhere, really), may easily end up rather dead by lynchmob when not developing a proper strategy to conceal their nature. Worse, since positive energy harms them, Darakhul may suffer rather unpleasant side-effects from even well-meaning clerics. A total of 12 different traits for Darakhul are provided to further customize your character: From having grown up in the empire’s capital to being able to select traits from the former race prior to ghoulification up to the option to choose lantern beetles (with full stats) as companions/familiars or determine a certain stock from which you were initiated into Darakhul ranks, the traits are balanced and neat. We also get a selection of 14 new feats that allow for the expansion of darkvision, healing by corpse-consumption, improved tracking of wounded creatures, gaining claw attacks, increase burrow speed and gain DR 5/magic, which upgrades to DR 10/magic – powerful, yes, but since the Darakhul is particularly vulnerable and fragile at low levels, a life-saver to prevent your PC from reaching that nasty 0…Partially adapting to sunlight, cha-mod/day using paralytic saliva (for 1 round +1 per point of cha-mod) and via two feats, one of which is rather high-level, Darakhul can even end their hunger. The problem of rage not working as intended for undead can also be countered via the undead rage-feat, which instead adds the bonus to cha and finally, there is a feat that allows you to consume hearts to power your metamagic – the latter, suffice to say, is a rather evil option. There also are 3 archetypes herein – the Quicksilver Alchemist who uses mutagens to enhance cha at the cost of wis (and said damage can only be healed by massive meat-consumption) and also learns to create undead and use the inflict-spells, but pays for this in weaker bombs. At 10th level, the archetype may choose the new “Death which dreams”-discovery, which nets him/her 10 negative hp before destruction and a buffer of 5 cha-points of attribute damage before true death – essentially making the character more like a mortal and less fragile in that regard. then again, at 10th level, these scarce few hp are not that much. the Imperial Hunter is perhaps the best slaver/catch ’em alive (and perhaps eat them)-archetype I’ve seen so far – iconic and cool and nothing to complain about! Finally, we get a focused wizard’s school with the Necrophage school. Associated with (surprise) necromancy, these wizards may bolster their power via flesh, gain undead familiars and consume the flesh to gain the benefits of speak with the dead, even if the target is still alive. Of course, we also get new magic items – 8, to be precise – from books netting bonuses on checks regarding the ghouls, a new type of bone armor (and magic version of it), helms that net you razor maw, ghoul saliva-paste-poison, paralytic poison-net-stones and ghoulish travel rations as well as morningstars optimized for tunnel fighting and close combat/grappling at the expense of working worse when attacking mounted or from higher ground. Beyond these, we also get 5 new spells – cannibalizing lesser undead, inciting forced confessions from targets, improve your flesh with DR that is negated by exposure to daylight or gain deadly, increased bite attacks. Oh, and there is a cantrip that allows you to conjure forth maggots to clean the flesh from bones of the truly deceased. Beyond that, we also get a new incantation – “Call the Reaper’s Pack”. Superbly fluffy, this cool ritual allows you to call forth one or more lich hounds, which btw. constitute the new CR 5 undead hunting dog: With frightening howls and deadly capabilities to finish off prone creatures with massive damage as swift actions, these undead hounds will drive the fear of the pack into your players! Editing and formatting are top-notch, I didn’t notice any significant glitches. layout adheres to Kobold press’ 2-column full-color standard and the pdf comes fully bookmarked for your convenience and also with several neat pieces of beautiful artwork. Ben McFarland actually manages to deliver a take on the undead PC-race that is both flavorful and powerful without breaking the game. Playing an undead is a challenge and not for the faint of heart, but with this supplement, I wager it can be a fun endeavor for all involved. Even with very minor ambiguities here and there, the intent of the rules is always clear, though the absence of age, height and weight-tables is a bit unpleasant – I realize that height can be taken from the parent race and age is practically immortal, but weight would be interesting… This second installment of the advanced races-series is fun to read, oozes flair and makes this a thoroughly nice offering at a more than fair price-point. Any supplement that actually can make me contemplate allowing an undead PC in a game is well-crafted indeed- especially since I expected to at least dislike or be ambivalent about this pdf. Great quality in crunch and fluff, compelling writing, neat production values – well worth a final verdict of 5 stars! 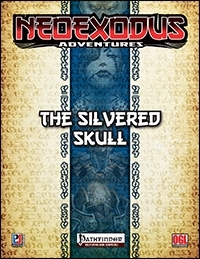 You can get this neat supplement here on OBS and here on d20pfsrd.com’s shop! This pdf is 35 pages long, 1 page front cover, 1 page editorial, 1 page ToC, 2 pages SRD, 1 blank page, 1 page back cover, leaving us with 28 pages of content, so let’s take a look, shall we? This being an adventure-review, the following contains SPOILERS, thus potential players are advised to jump to the conclusion. The Wandering River area into which the PCs stumble makes one thing relatively clear – they’re in for trouble, as ominous mists are rising and no matter how well they fare survival-wise, they always seem to end up in the same location again. Healing magic seems to be impeded in certain areas as well. Sounds familiar? Well get this – the area, suffused by dark magic and tragedy, is about to be drawn into becoming a full-blown domain of dread. Yeah. DMs like yours truly started smiling exactly upon reading that, for this module is shamelessly and unabashedly a Ravenloft-module in everything but IP-protected name and as such comes with weird details as well as a creepy children’s rhyme make sure that the module manages to actually convey a slowly rising sense of terror and dread, something only scarcely seen in modules nowadays that all too often focus on blunt-force horror. All Hallow’s Eve draws near and with it, the decision whether the PCs and the whole region are sucked to the domains o dread. I mentioned a tragedy and it is what lies in the past of the small town River’s Edge that is directly responsible for the terrible fate that is about to befall the region. Where once, druidic old sacred stones held the encroaching mists of the Demiplane of Dread at bay, a misguided cleric of a radical religion (the Lightbringer – easily inserted into just about any setting), one lord Theodon, toppled several of these stones with his fanatics. While his life has ended many moons ago, his spirit yet wanders, impossible to vanquish, these lands, ready to become the Dark Lord of the area. In order to avert this dread fate, the PCs need to decipher the insane ramblings of the last senile member of the old faith as well as cryptic clues of the benevolent spirit only known as Autumn Lady, and determine the location of the right sacred stones and re-erect them – all while the clock is ticking and All Hallow’s Eve draws closer. In order to succeed, the PCs have to properly research the location of the correct stones from the archives and aforementioned insane ramblings as well as manage to survive – for both the spirit of Theodon and ghostly hounds will start hunting the PCs, essentially immortal and rejuvenating as long as the dread grip of the mists has not been broken. As soon as they show up, the module switches mood from a rising suspension of subtle horror to one of desperation and a run against the clock – when the PCs finally encounter the spirit in the tunnels that contain the last of the stones, they will have been sorely tested. The pdf provides a total of 9 pages of battle-mat-style, grid-studded maps in full color and 1 page b/w player map of the area. Editing and formatting are very good, I didn’t notice any significant glitches. Layout adheres to a 2-column standard and the pdf has a full color background, which renders the pdf slightly less user-friendly than necessary. Out of some weird reason, the statblocks adhere to a one-column standard and the statblocks, while adhering to standard formatting, lack bold print etc., making them harder to read than necessary. The maps are ok, but nothing to write home about. Unfortunately, the pdf has no bookmarks, which serves a quite a detrimental factor. Oh boy. End of Autumn gets Ravenloft and proper Gothic Horror more than any self-proclaimed homage I’ve read. The mood, the characters, the slow build-up and its deserving pay-off – all those conspire to make this module by Jeremy Cusker, writing-wise, to rank as a stellar example of its craft and a must-have for fans of Ravenloft. But not all is well – whether it’s the not particularly compelling font, the lack of bookmarks or the statblock presentation – layout-wise, the module suffers from some beginner’s glitches that detract from its appeal. Most detracting, though, is the unfortunate brevity of the module – a proper detailing of the town of River’s End, more encounters that are not directly tied to the story, a red herring or two – and this would be a superb example of the art of adventure-crafting. As presented, it unfortunately falls a bit flat in these regards. That being said, if you’re a fan of Ravenloft (or atmospheric, dark modules that don’t rely on an overabundance of gore) and if you can see past the less than pleasant presentation, this still might be a 4.5 or 5-star file for you, in spite of the module’s relative brevity. As a reviewer, though, no matter how well this suits my tastes, I’ll have to take these issues into account. If the presentation/brevity bug you, then this pdf would be a 3.5 or 3 star file for you. In the end, my final verdict thus shall be between both and clock in as a final verdict of 4.5 stars, rounded down to 4 for the purpose of this platform. You can get this neat nod to the Demiplane of Dread here on d20pfsrd.com’s shop and here on OBS! This installment of the Dungeon Dressing-series is 11 pages long, 1 page front cover, 1 page advertisement, 1 page editorial/ToC, 1 page SRD and 1 page back cover, leaving us with 6 pages of content, so let’s take a look, shall we? Nothing makes player’s eyes gleam like the promise of loot just out of their grasp and chests are predisposed for dumping the precious thingies inside that adventurers covet. The thing is – with mimics etc., there simply is a bit too much paranoia going on. After all, just about all chests are secured via traps – and a chest popping up equals loot, so the rogue pulls out his/her kit. We all know the routine. The thing is – routine gets boring. And people ought to use chests for things beyond magic loot, shouldn’t they? Enter this pdf, an excellent tool of desensitizing players and characters and adding more detail to rooms in the same stroke: Herein we find chest contents galore, with the first table offering 100 entries for clothes and possessions: Moth-eaten shirts, cult robes, lace gloves and dancing shoes alongside tools, remnants of chain-shirts, shirts with more than two arms and spiked collars and manacles – there is a fascinating diversity of contents here. Now if you’re looking for something more out of the ordinary, then wizard’s chest contents, 46 entries to be precise – blank parchment, astronomy charts, severed bird claws, gravestone etchings, incense – all the nice things one would expect from the more esoterically inclined masters of the arcane. Now clerics also tend to hoard interesting contents and hence, the third table offers 46 entries that could also be found in the care of other devout characters – wine-cups, herbs, ceremonial garbs, slaves and ointments, polished amber blocks and even a miniature altar within the chest await your PCs to discover them while they’re snooping through the possessions of the clergy. Of course, food and drink are also stored in chests like these and hence we get another table (with just as many entries) holding chilled meat pies, rotting mutton cheese, skinned hares and even valuable herbs (with a GP-value) to offer something for the health and sustenance of the PCs. Finally, we get a table of 46 entries containing odds and ends – rusted keys (and locks), caltrops, an assortment of glass eyes (creepy! ), mustache wax and boot polish or a lonely, cracked teacup tell their own little stories a DM can easily expand and use as a basis for further adventures/complications. Editing and formatting are top-notch, I didn’t notice any glitches. Layout adheres to RSP’s 2-column b/w-standard and is exceedingly crisp. The pdf comes in two versions, with one optimized for screen-use and one for print-use. The pdfs comes fully bookmarked for your convenience. 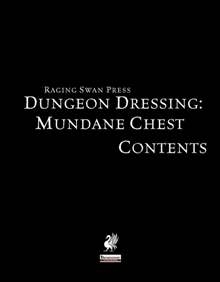 Designer Josh Vogt has delivered a rather interesting, nice supplement full of intriguing, at times, funny, at times creepy and all out interesting mundane contents to make your chests more common and thus, the treasure chests ultimately more rewarding when they do pop up. There’s not much to complain in this particular supplement – it is a thoroughly rewarding supplement that is bound to see quite some use at my table. If anything, I would have enjoyed one or two more far out contents herein, but that is no reason to rate this neat supplement down. My final verdict will clock in at 5 stars. You can get these contents here on OBS and here on d20pfsrd.com’s shop!